After checking out of our hotel in Waterville, Maine Sunday morning we started the drive to New York City. We weaved our way through precious little ocean towns, and stopped at a handful of geocaches along the way. Throughout the trip I had been checking Roadside America because that’s what I do when I’m anywhere I’m unfamiliar with. 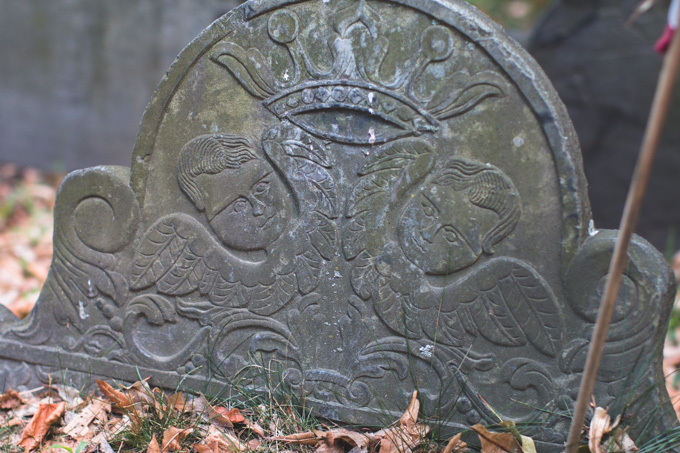 Coming up, in Boston, was Mother Goose’s Gravesite*. Jeff desperately wanted to visit Boston since he’d never been there but I was insisting we waited until we actually had time to explore the city. I wasn’t interested in spending a small amount of time, I wanted to wait until we had enough time to see everything Boston had to offer. Well, that was until I clicked on the photo of Mother Goose’s headstone. IT HAD A SKULL! 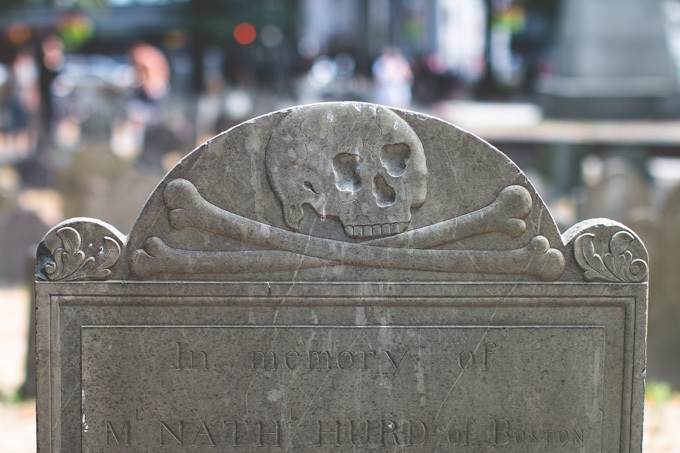 Okay, so if you’ve been keeping up to date with my cemetery posts you might recall me mentioning that I love headstone symbolism. There is tons of it here but Ohio just isn’t old enough to have the kind of stuff I really want to find. Number one on my wishlist of things to find was a skull. 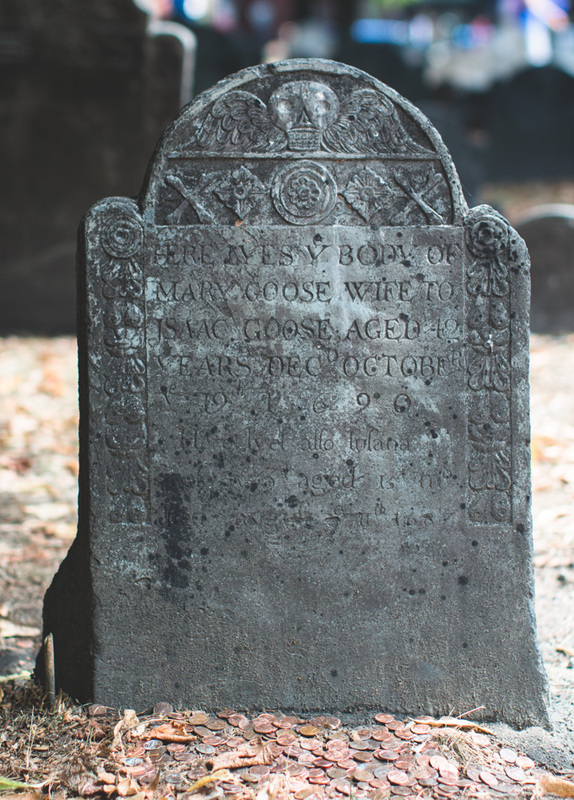 The fact that I was guaranteed to find one, and on Mother Goose’s headstone of all places, meant I was all of a sudden SUPER interested in Boston. In no time at all, I mean other than that 25 minute detour because of ONE single wrong turn, we were in Granary Buying Ground. I have never in my life seen a cemetery so full of people. I guess it’s not too surprising though considering the amount of history packed into this small space. 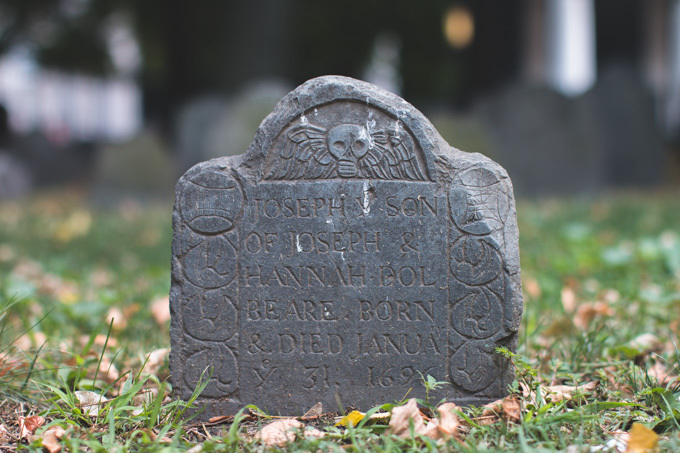 John Hancock, Paul Revere, and Samuel Adams are just a few of the big names buried here. 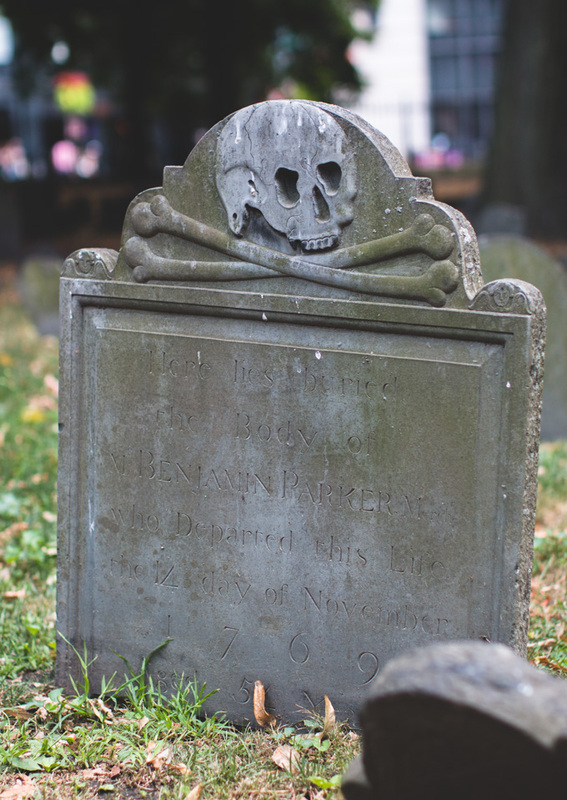 Not even going to lie though, despite being surprised at the amount of historical figures here, the highlight for me continued to be the fact that nearly every single headstone was decorated with a skull. I was in heaven! 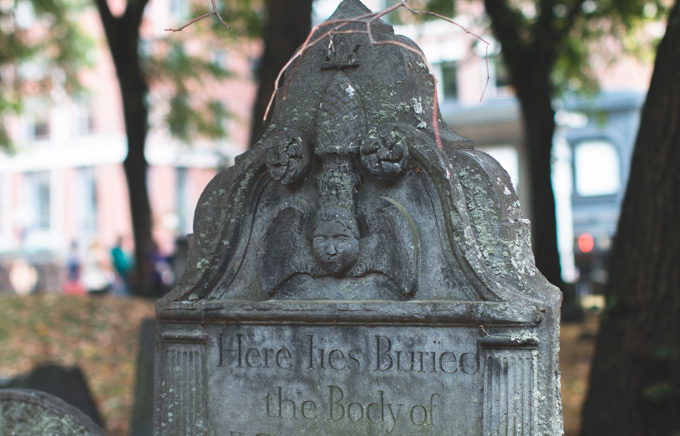 Granary Burying Ground is the third oldest cemetery in Boston, founded in 1660, which makes Cleveland’s oldest cemetery (1826!) sound like it was started just yesterday. It also means this is easily the oldest cemetery I have ever been in. It is safe to say they just don’t make ’em like they used to. 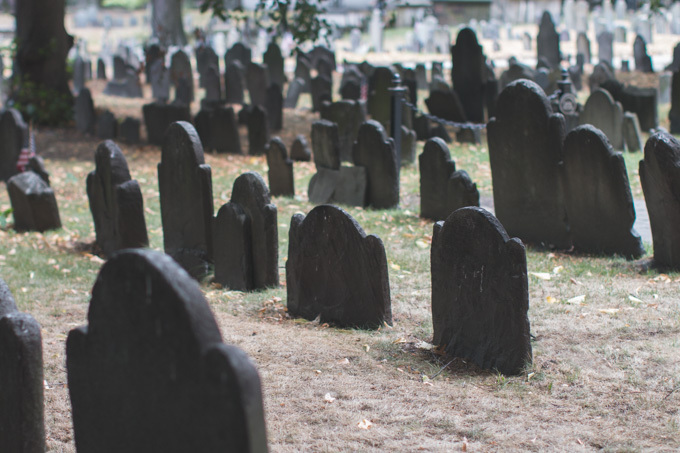 The only thing that would have made this cemetery more enjoyable for me is if it wasn’t packed full of living people (and if it hadn’t been one thousand degrees!) I imagine on a cool weekday this place is an absolute dream. I’m still looking forward to seeing more of Boston some day, even more than I was being this very brief visit. 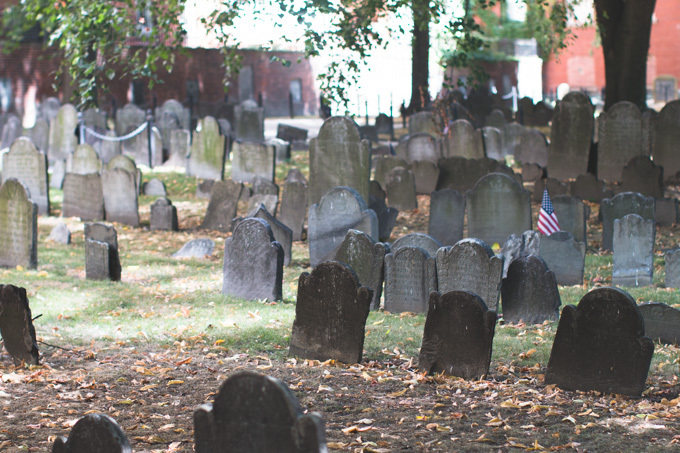 Granary Burying Ground was an excellent first impression of the city. *Apparently she is not THE Mother Goose. 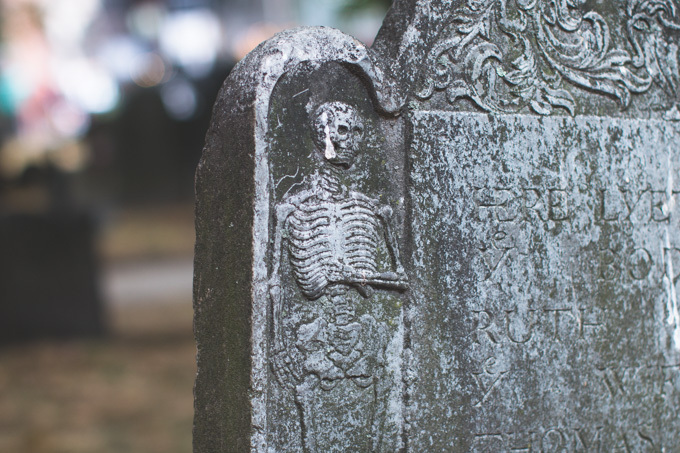 Some sources say the myth was started to encourage tourism to the cemetery. If you’d like to do more reading on the subject you can do so here. Regardless, it got me to this cemetery and it was an incredibly headstone so it’s all good by me. Wow, the skulls on these are so interesting!!! I especially love the headstone for Benjamin Parker. 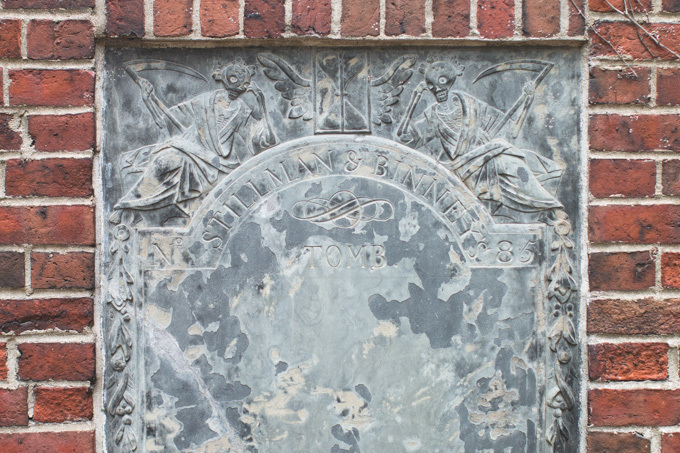 I would prefer to be cremated, but if I ever change my mind-thats the kind of old school stone I would like to have. What an incredible cemetery! Isn't that one incredible?! Definitely one of my favorites. 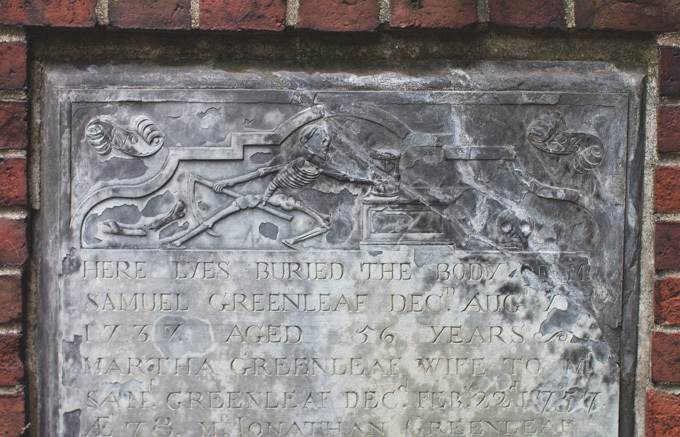 I'd like my body donated to science but there's definitely a part of me that wants a really really awesome headstone. This is so cool!! I thought there would be a marked difference,between a seriously old cemetary and the newer one but not this big a difference. Will you head back to the coast for the fall colors? Seeing them has been on my list for years! I'd definitely love to! I'm not sure it's in the cards this year though. Someday!! oh wow, this place is beautiful! The photos don't even begin to do it justice either! How neat! Boston is a city that I've always wanted to visit because of the rich history surrounding the area. 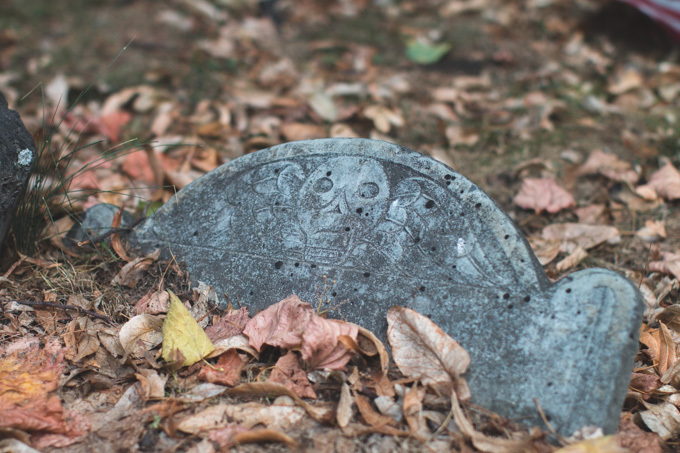 There's something so beautiful in wandering around a quiet cemetery. I'm looking forward to going back. Boston seems like a lot of fun. If you ever do any international cemetery exploration, I highly recommend the Old Jewish Cemetery in Prague. There's so many headstones packed into such a small place, it's really amazing! And there's a really cool cemetery in Romania called the Merry cemetery. I spent last summer in Romania and never made it there. I was so bummed. If you ever come back to Boston, I've heard great things about the Mt. Auburn cemetery but haven't been there myself yet. I live a 5 minute walk from the Forest Hills Cemetery in Jamaica Plain and it is absolutely beautiful. Anne Sexton, e.e. cummings, and more famous peeps are buried there. There are a lot of old graves, a lot of Celtic-looking crosses, beautiful old statues and mausoleums, as well as contemporary sculptures. It's beautifully landscaped and maintained. It is a pretty popular destination on nice days, but I've never seen it really packed. Highly recommended. And JP itself is a lovely part of the city. 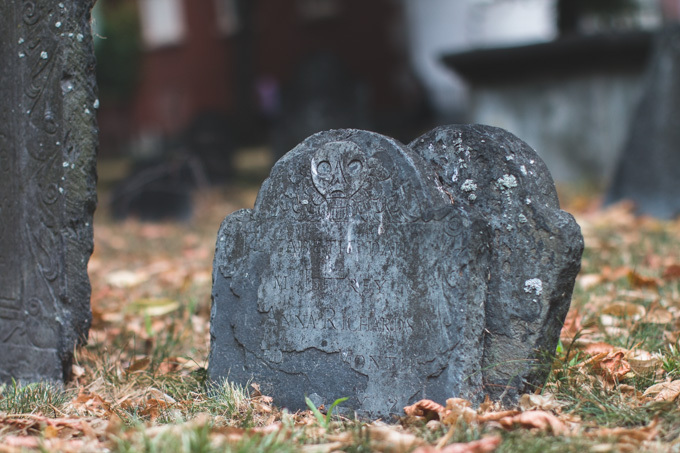 There's no parking at the cemetery but you can find plenty of street parking within walking distance that is unrestricted on weekends, or if you're staying elsewhere in the city, it's within walking distance of the Forest Hills T stop (on the orange line). Jackpot! So happy you finally got to see your skull tombstones! My friend went to this one a while ago and sent me photos and I was dying with jealousy. Boston is high on my list of places I need to get back to! I seriously could not believe all the skulls! It was heaven for me!! Definitely somewhere you'd dig too. so gorgeous! i love looking at these kinds of graves. Those are awesome… I used to live next to a cemetery and would go shooting over there occasionally. Kinda miss it. Yes! So glad you got to see this. 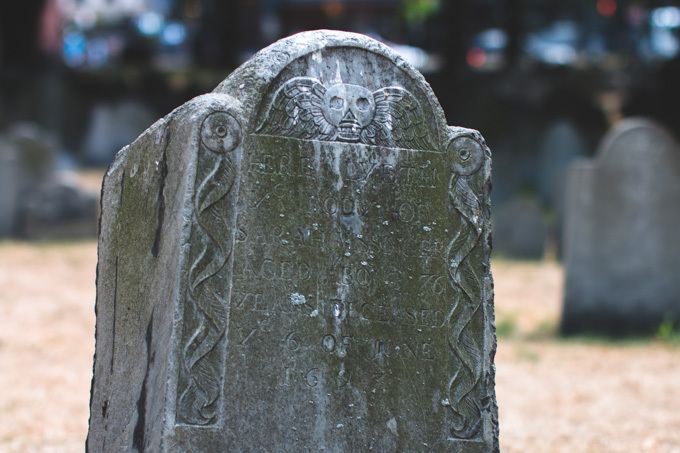 It's great to see your awesome pictures of the gravestones too. 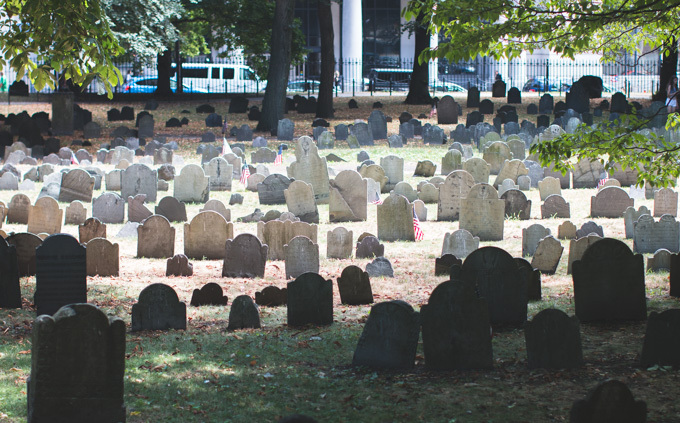 Whenever you make it to Boston for an extended trip, I can recommend a ton of great cemeteries and cool little spots. Awesome, thank you, I'll have to remember that. I really want to come back and see all that the city has to offer.